Happy almost New Year everybody! I have three tracks for you today from New Jersey’s Damian and the Criterions. 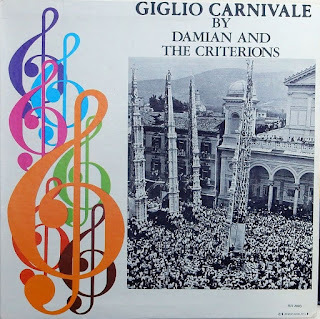 Damian is Damian Vecchioli, and he and his ‘band’ the Criterions released at least three self-funded albums – Versatility, Giglio Carnivale and Avant Garde - and one 45 of low-fi nonsense in the early 1980s. I use parentheses for the word ‘band’ as it appears that Damian was pretty much a solo artist. Damian also recorded as Damian and the Street People, issuing a pair of 45s, Witches Brew (a re-issue of the Avant Garde album track included here) and Funk With a Punk (a re-titled issue of another Avant Garde track The Slam). Any money earned from the latter 45 was to be donated to a ‘non-denominational mission fund’. Judging by his obsession with the Neapolitan giglio feast (a festival held to honour the fifth century bishop St. Paulinus of Nola), it’s a safe bet to suggest that his family may have Italian ancestry. Vecchioli is not a common name, but I can find no record of a Damian Vecchioli living in New York or New Jersey at any time. Also, Damian isn’t a very Italian-sounding name, which leads me to believe that it was, in fact a pseudonym. Of all the Vecchiolis I have found listed, only two fit the time frame - Peter Paul Vecchioli, who was born in New Jersey in 1946 and died in 2004, and John Vecchioli, born in New York but died in Florida in 2013. If anyone out there knows anything about Damian and/or his career please do get in touch. 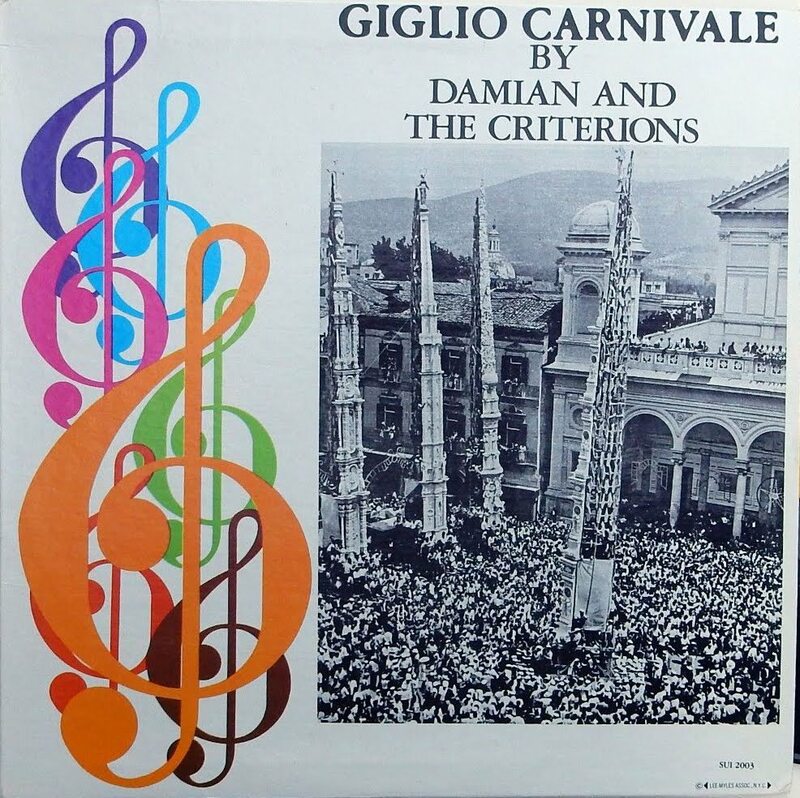 Here are both sides of Damian’s first 45, Giglio Carnivale and La Barca, issued on Dorell Records (both tracks later turned up on the Versatility album), plus Witches Brew and the Slam from his third album Avant Garde. Here we go: the final instalment for this year. Today’s Christmassy selection kicks off with British Comedian Ken Goodwin, star of 70s TV who, some of you may recall, scored a hit in 1972 with the sugary . Well, in 1979 our Ken released a Christmas album – Merry Christmas Darling – and revisited his seven year old hit, rerecording a festive version replete with sleigh bells and creepy child. The result is even worse than the original. Hurrah! Nothing quite says Christmas like an album from a ganja smoking albino reggae singer, does it? Next up, from his 2003 release A Very Very Yellow Christmas, here’s Yellowman (a.k.a. Winston Foster) with We Wish You a Reggae Christmas. It's not great, but when you consider that the man lost half of his face to cancer in 1986 it's a surprise he's still making records at all. We’ve enjoyed the unique song stylings of talent show reject William Hung before: like Susan Boyle the man has managed to eke out a career from failure – although unlike SuBo none of his albums have hit the top spot and he has never been the recipient of a Guinness World Record. Anyway, we’re quibbling. Here’s William with The Little Drummer Boy from his second album, 2004’s Hung For the Holidays. I feel a bit conflicted about our final choice – after all the poor woman is clearly not well these days, as her recent appearance on Dr Phil showed – but this was recorded 25 years ago when she was still relatively sane. And besides, it’s absolutely awful. 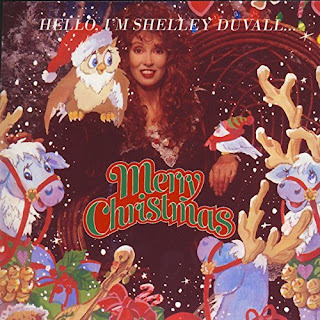 In 1991 actress Shelley Duvall (The Shining, Popeye) issued the thoroughly dreadful album Hello… I’m Shelly Duvall: Merry Christmas. Doing her best impersonation of Little Marcy, and attended by the obligatory children’s choir, Shelley’s bizarre album was followed by a further release: Hello… I’m Shelly Duvall: Sweet Dreams, although wither one of these albums is enough to give you nightmares. Here’s the award-winning actress with Gotta Be a Christmas... and if I had a wish it would be that the poor woman gets the financial and mental health support she needs this Christmas. Have a fantastic Christmas, a cool yule and a thoroughly excellent New Year... and a huge thank you to all of you for all of the support, the suggestions and so on. The first track from this week’s collection of festive futility is definitely rated NSFW – you have been warned. 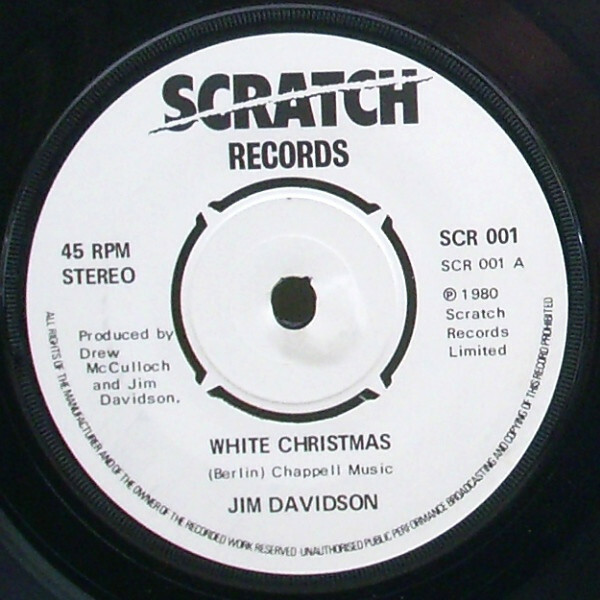 We’re kicking off (thanks to a timely reminder from my good friend the Squire) with the thoroughly offensive Jim Davidson and his equally offensive version of White Christmas – knowing how vile the wife beating racist is it should be no surprise to learn that he recorded his version in character as Chalky White, a crass portrayal of a West Indian. When he performed his Chalky material on BBC One’s Seaside Special in 1977 there was public uproar, with The Stage criticising Davidson for his ‘crude racist jokes’, yet this 45 was issued in 1980. This nasty piece of plastic even features a de rigueur children’s choir. What must the head of that particular school (thankfully uncredited on the disc) have been thinking? This is beyond contemptible. Recorded in 1990, O Holy Night by Steve Mauldin has been doing the rounds for years now. Steve is an arranger and conductor, and the original version was arranged for – and recorded by – The Christ Church Choir and their lead vocalist Guy Penrod. That particular recording was issued, on Sing Noel, by Star Song Records. Steve’s version was recorded in the studio as a bit of a laugh, just to see if he could match the range of Penrod. Clearly he couldn’t. It’s never been officially released, and this has been dubbed from a YouTube video – but it’s one of those things that just had to be heard! Finally today we have both sides of Leappo The Frog’s 45, Christmas in Frogville and Look Before You Leap. 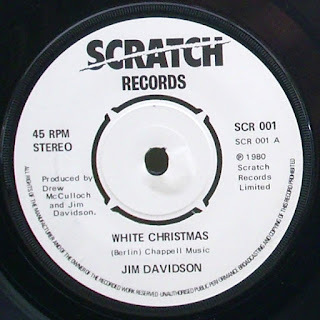 The flip has nothing to do with Christmas, I’m simply including it here for completists (I’m not going top provide you with the other side of the Jim Davidson disc: if you want it go find it yourself!) Issued by Del-Ray Records of Delaware. Co-author Jimmy Stayton was a rockabilly singer who issued four of 45s under his own name in the early 60s. Do yourself a favour and hop over to Dead Wax, where I originally found this clunker. BTW, it has been suggested that I include some tracks from Ringo Starr’s Christmas album, I Wanna be Santa Claus… but in all fairness that particular album is heaps better than Billy Idol’s genuinely dreadful Happy Holidays. So Ringo gets a pass this year – I may not be so kind in 2017! Welcome to Part Two of this year’s Christmas Cavalcade. Three more awful festive-themed tracks for you to suffer along to. First up is a recording I was blissfully unaware of until yesterday, when The Squire decided to send me in search of a copy. This utterly unspectacular single-entendre novelty, Give U One 4 Christmas, was issued by female ‘vocal’ duo HotPantz a.k.a Kelly Robinson and Shelley Mintrim. This dreadful piece of rubbish actually managed to scrape the UK Singles Chart, peaking at a dizzying number 64. Shocking; in a stocking! It's Ho! Ho! Hopeless! Next a pair of tracks sent to me earlier in the year by WWR follower Dan Sheldon. Lee Smith’s A Letter To Mama, issued in 1988 by the tiny Nashville-based country label Airborne Records, backed with a bland, instrumental version of Silent Night - the same track as the a-side minus Lee's heartfelt vocalising. Unfortunately I can't tell you much about either Lee Smith, but Airborne was a country label that had Mickey Gilley, Stella Parton and Mickey Newbury on its books. The company also signed singer Curtis Wright but does not appear to have issued any recordings by him 9at lesat not as a solo act). This appears to have been Lee’s only release: if history is anything to go by I wouldn’t be in the slightest bit surprised to discover that he was a local radio DJ. Maybe someone out there can enlighten us. Airborne's final release (in 1991) was a double album collection of Dr Martin Luther King speeches. 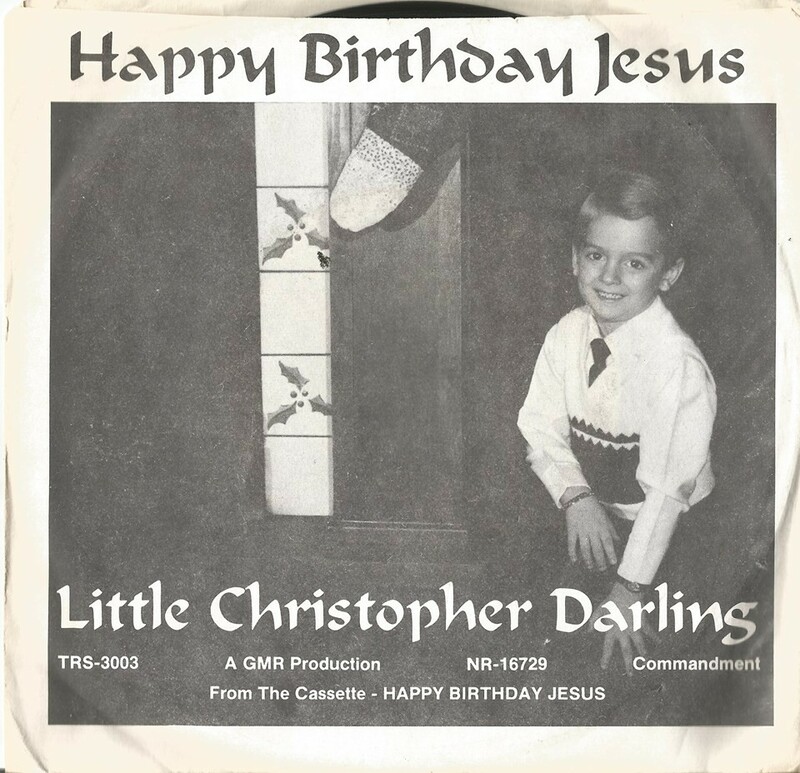 The next track, also provided by our kind benefactor Mr. Sheldon, is Happy Birthday Jesus by Little Christopher Darling (not the same Happy Birthday Jesus as the song recorded by Major Bill Smith or the one by Little Cindy). This time I have been able to find a little info about the Little Darling. 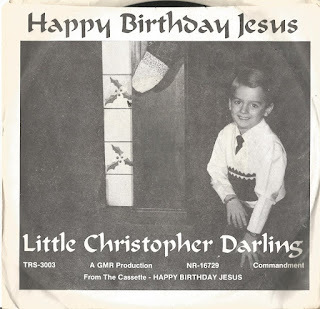 Born in 1979 and hailing from Finksburg, Maryland, Little Christopher started singing gospel music at the age of five: he had a ‘hit’ (well, it got played on local radio a couple of times) with a cover of Bobby Grove’s Jesus This Is Jimmy. Happy Birthday Jesus (the same track appears on both sides) was issued as a promo of sorts for a cassette release of the same name and was issued around 1987. LCD released at least one other album (or cassette) entitled Please Don't Tell My Daddy (That Jesus Isn't Real). A surprisingly popular draw at churches in the area (he had ‘a special message for mothers and children’, according to one press notice), he was known locally as ‘the Little Evangelist’. Anyway – have a listen and we what you think., If you can bear it I’ll be back next Friday with more. Hello folks! Yes, it’s that time of the year again – with just 23 days left until Christmas the next few WWR posts will concentrate on obscure, bizarre and just plain awful festive-themed discs, a cornucopia of cacophonous Christmas caterwauling if you will, to soundtrack the season. Oh yes! We’re kicking off with some seasonal plagiarism: songs that have stolen something from someone or somewhere, and first up today is our old friend the song-poem stalwart Gene Marshall (a.k.a Gene Merlino), with the double sided ‘hit’ Merry Christmas All and Christmas Day. 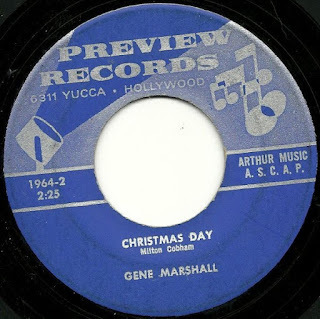 The disc, issued by Preview in the early 70s, is in pretty poor shape, so my apologies for the poor quality, but what interests me is that the tune for the a-side – with lyrics credited to one Alexander Liftee – has clearly been Liftee-d from the much better known Jingle Bell Rock. Flipside Christmas Day, is a mediocre slice of song-poem hokum from the pen of Milton Cobham. Next we have both sides of the 1959 45 from Kenny and Corky, a pair of singing puppets stealing David Seville’s Chipmunks shtick wholesale. Nuttin’ For Christmas was originally a hit for six-year-old Barry Gordon (and five other acts) in 1955. Many of you will know the flip side, Suzy Snowflake from the vastly superior (!) version recorded by Marcy Tigner, a.k.a Little Marcy. Issued by budget kiddie brand Big Top the disc was a minor hit in the States, which prompted the highly collectable London label to issue the coupling in the UK in November 1959. Barry Gordon went on to find fame as an actor, appearing in everything from Alfred Hitchcock Presents to Star Trek: Deep Space Nine, Star Trek: Voyager and Curb Your Enthusiasm. A noted voice actor, he served as the president of the Screen Actor’s Guild and, in 1998, was the Democratic Party nominee for the United States Congress for Pasadena, California.